It’s Pancake Day. The day we’re supposed to eat up all the goodies in preparation for Lent. Possibly you’ll try to stop eating chocolate or give up alcohol but perhaps more as a dietary or lifestyle choice than for religious reasons. Good luck I hope you shed hose excess pounds. There is a simple lifestyle choice you could make this Lent that could have genuine and long-term impacts for the better and it’s really simple. Start asking if the organic flour, grains & pulses you’re buying are British grown. Ask at the supermarket, farmshop, wholefood shop even at your bakery – wherever you are buying your organic flour or grains. Why is this important? It is hugely important because of the massive biodiversity benefits organic arable farming delivers. All organic farming provides biodiversity benefits “On average, organic farming increased species richness by about 30%. This result has been robust over the last 30 years of published studies and shows no sign of diminishing.” But if we dig a little deeper we see that organic arable (cereal and pulse) production provides the greatest biodiversity benefit of all. The same study highlights the greater benefits delivered by organic arable production. The graph below indicates that organic arable land has approximately 40% on average greater biodiversity than conventional arable land. Organic Arable acres provide highest biodiversity benefits. Given this huge benefit that organic arable area delivers why as a buyer of organic flour for your pancakes would you not want to ensure that the wheat milled for your pancakes was grown in the UK and so the biodiversity benefits created could be enjoyed by you and your family and friends in Britain? Buying imported wheat for your organic pancakes is effectively exporting this massive improvement in biodiversity which you are rarely ever likely to see. Surely that’s a bit like giving up chocolate for Lent to loose a few pounds and then developing a penchant for fudge. So this Lent make a positive change through your buying and ask for British grown organic flours and grains to ensure you get the full benefits of your organic purchase. On 18th March a Organic Arable brought together organic farmers, some buyers of both animal feeds and human consumption grains and other stakeholders to explore how the organic grain market could work better under the title – “Nurturing Understanding – reaping benefits”. The day was chaired by Lawrence Woodward and there were presentations from Raymond Hilman, Whites Speedicook and Andrew Trump, Organic Arable. In addition the audience were asked to consider in groups what a perfect grain contract would look like and why there is not better co-operation within the supply chain. The first presentation by Andrew Trump set the scene for the current organic market seeing it in a global perspective. Whilst the UK is seeing some small signs of growth in organic sales it lags well behind other international markets in Europe but particularly the strength of the US market. At £24 billion the US organic market is 43% of global organic sales and grew by 11% in 2014 and this annual growth is larger than the whole UK market. Whilst demand grows supplies of arable crops remain stubbornly static and the traditional suppliers to the USA of combinable crops, Canada, Argentina, Australia and South Africa are not seeing significant additional conversion of organic land and certainly insufficient to feed US demand. In the USA grain prices have risen dramatically and this combined with the strength of the US Dollar against international currencies has led the US to look to new countries to fulfil their demand. Of particular importance to the UK and Europe is the presence of the US in the Black Sea. In 2014 US purchases of Romanian maize grew from $454,000 in 2013 to over $11,000,000. A combination of a rapidly growing market, a strong currency and the volume requirements the US need to feed their organic livestock sector is likely to make them an influential entrant into the European market in the short to medium term. They will also have an influence as they start to buy processed product out of Europe in greater volumes, for example there was recently talk of a need for additional butter requirements to fulfil the US market for shortbread. The possibility of GM commercialisation in Ukraine was raised. Currently GM free, the political unrest has in Ukraine has led to a greater requirement for international finance and with this (whether directly or indirectly) there seems to have been a move towards a softening in the position towards GM cultivation amongst several Ukrainian agricultural organisations. The prospect of GM cultivation of maize would add uncertainty to the supply of organic maize from the region as the possibility of GM contamination would increase. The conclusions of the presentation were that Black Sea organic supplies would become more expensive and less certain with the greater possibility of supply shocks making it a less certain source of product for the UK. However, the opportunities to encourage greater supply was also mentioned. The suggestion was made that with better financial returns available to organic farmers and greater technical support being supplied by the sector it was only the market that was the uncertainty for new entrants. If better longer term supply opportunities could be developed this uncertainty could be largely removed providing great opportunities for additional organic conversion. Raymond Hilman from Whites Speedicook then spoke about the supply arrangement they have for organic milling oats with Organic Arable as an exemplar of what can be achieved if buyer and seller work together to overcome supply issues. Whites Speedicook wanted to improve milling oat quality being delivered to the mill to improve their milling efficiency. Doing so has allowed them to become more competitive in the market and pay a stable price (with quality premiums) to growers. This approach has also developed a strong and loyal group of producers who are working hard to improve oat quality as they now understand both the benefits to their business but also their customer with the rewards generate shared. Additional benefits have accrued as Whites Speedicook have reduced their procurement costs and the group has established a forum to share best practice and a research fund to undertake some trial work to help drive the improvement in oat quality. Finally, there are social benefits as friendships are formed the growers are now acting as informal advocates for the Whites Speedicook brand. We are delighted to once again be supporting the National Organic Combinable Crops 2015 run by Organic Farmers & Growers and are offering you the chance to win your ticket the event. The competition is relatively straight forward. Below are 2 pictures of organic products that were spotted adorning a television programme and a catalogue respectively. The challenge you have to meet is to identify the two brands. All correct entries will go into a hat on 15th June and the first 10 will receive a free ticket to NOCC 15. It couldn’t be simpler. Whenever I read about variety trials in organic systems the sage words of Prof. Martin Woolfe come to mind. His view is “The most important aspect of yield organically is the fertility of the soil the crop is grown in, the second most important thing is the growing season and a long way third is the variety”. That said prior to planting there is little that can be done to significantly improve soil fertility and there is nothing that can be done about the growing season and so varietal choice becomes important as it is a factor of the production cycle that is within the producer’s control which is possibly why farmers place a lot of importance on varietal choice. A further comment is that it is worth looking at the statistics behind the trial results. Seed merchants always focus on top yield. However, the trials are designed and analysed to provide robust information to support decision making. It is worth noting that the results will show whether the yield figures provided for a variety are significantly different from other varieties in the trial. If the yields of two varieties are not significantly different from each other then you can conclude that were the trial to be repeated the same ranking would not be expected. Just because one variety has a higher yield DOES NOT mean it will have a higher yield if the trial were repeated unless the yield is shown to be significantly different from the second variety. Make use of all the information supplied to make management decisions not just some of it. With these provisos ringing in your ears below are the results from the trials run by Organic Seed Producers at both Shimpling Park Farm, Suffolk and Rectory Farm, Buckinghamshire (where the National Organic Cereals 2014 was held). The results seem to largely confirm Martyn Woolfe’s hypothesis that variety makes little difference whilst the system does. The vast majority of the variety’s do not show any statistically significant difference in yield at either site. How can this be when the yield for Revelation at Shimpling Park is 1 t /ha greater than Croft? Indeed it does but the results also show this is not significant. This means that were the trial repeated the same results would not be predicted and so Croft could just as easily outyield Revelation. On another note. I have a soft spot for Claire. In ORC trials in the early Noughties it was a reliable performer and looking up the data in ORC Bulletin 64 Dec 2002. A yield of 4.35 t /ha was achieved with Claire topping the yield chart. The trials then were held at Chadacre Farms a neighbour of Shimpling Park and so a reasonable comparison. So 12 years later on the same variety yielded 4.2 t /ha. -quite consistent performance. With samples starting to go through the lab we have some test results but alongside these we have noticed some visual differences between the varieties. The advice we have is that bushelweight is not the only determinant of oat quality and as the video below shows there is a significant difference between the size of the grain despite the bushelweight recorded by the lab. There are also some results back from the winter variety trials run by OSP at Great Brickhill, Bedfordshire and Shimpling Park, Suffolk that indicate no difference in yield for the varieties in the trial apart from Rozmar which was lower yielding at Great Brickhill. Grain quality, measured as bushel weight showed no difference at Shimpling Park with Rhapsody and Selwyn showing a lower bushelweight at Great Brickhill. The Bugnot Rapide is a shallow plough developed in France with the organic producer in mind and was seen working at Shimpling Park Farm on 20th August. The soil type in Hanslope clay and the field being ploughed was in wheat this season and had recently been spread with Limex and was being ploughed to incorporate the Limex. Recent rains – approx. 50 mm over the last couple of weeks had softened the ground and the combining and spreading operation had resulted in definite wheelings about 60 mm deep. Between the wheelings the ground was quite spongy. It was probably too wet to plough and would have improved for being left to dry and was being ploughed for the sake of the demonstration. The shallow mole boards have a rather obtuse angle and there was some thought that the furrow was being rather “bulldozer” and it thought a knife added to the chisel might help this. The inversion of the stullbe was far from complete. It was noted that the stubble was quite long – a function of a yawling combine header and an impatient contractor and the stubble incorporation was far better on areas where stubbles were shorter. Having seen the plough in action we looked at some land ploughed about 10 days previously. This had then been passed with a sub-soiler and press. There had been very impressive kill of blackgrass and a new flush starting to emerge that will be dealt with through further cultivation. It was felt that the shallow plough and subsoil/press combination had left a tilth that could be drilled with little further cultivation. There was some discussion about the use of a green manure/cover at this point but it had been rejected due to the additional costs of seed and establishment (exacerbated by low prices). The adjacent field had been ploughed using the farm’s Kverneland deep plough and there was no observable improvement in the incorporation or kill of blackgrass. The field was noticeably rougher and certainly required more cultivation head of any drilling. This was a more expensive approach with little of no discernable benefit. In conclusion the Bugnot Rapide looks like an interesting tool. The benefits being greater working speed and so workrate and lower horsepower and fuel requirement. It may not replace a deeper plough at Shimpling Park for a few years (if at all) but will certainly be an effective, low cost alternative when conditions are right. Why we should be encouraging Nightcrawlers and using Latex on our fields? Luckily I have an American sitting across the office from me to translate and I am reliably informed Nighcrawlers are “big fat worms” – thanks Kathy. The video below is a fantastic illustration of how beneficial these magnificent creatures can be in developing our soils structure and improving water penetration and drainage. What a great way of illustrating the state of soil structure on farm. Should farmers start using Latex on their soils to see how well worm activity is improving their soils, if at all? It would be great to see this on some UK soils to get an impression of the soil structure the fissures, worm activity and possible barriers that were in the soil. The pro-bee lobby have been very successful in promoting the cause of bees in recent months following the neonicotinoid ban which is great as we need to support and encourage the bee population. However, there is one very simple way in which all bee supporters could have a huge impact upon bee survival – to buy more organic food. As organic grain farmers we do not use neonicotinoid seed dressings or use any insecticides and we have greater pollinator feeding sites as through the use of a range of clovers (red clover is better for bumble bees and white clover better for honey bees) and other legumes in our fertility building crops. We have greater “in-crop biodiversity” the kind way to refer to weeds, such as thistles and charlock which are great for pollinators. These benefits are across the whole farm and embedded into the farming system and not on small, defined areas of enhanced environment as would be the case for a conventional farm. Although such an area is useful it is less beneficial that having a whole-farm systemic management system that will improve feeding sites for pollinators. 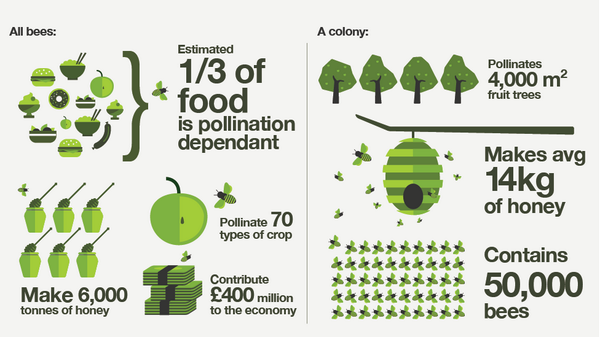 It would be great if the NGOs and others supporting bee populations could give the clear message that: to support bees people should eat more organic food; then consumers would have a clear, simple “call to action” to help support bees. The EU have proposed changes to the EU regulation that governs the way organic agriculture is certified – the rules to which organic farmers and processors adhere. The first question should be whether there is a need for a change? Whilst not perfect the current regulation seems to work reasonably well. The market is developing across Europe and the rest of the world and starting to recover in the UK. There is a regular grumble about seed derogations but this is perhaps more to do with interpretation and implementation of the regulation that the regulation being at fault. A significant piece of regulation with just one fault could be regarded as a success – so why change it? The changes have been significantly influenced by a consultation exercise which was poorly promoted and the majority respondents were French organic consumers. A discerning group no doubt with a fine food heritage but hardly the best constituent to determine the direction in which technical organic production intricacies should be pushed. Their views perhaps represent an idealised view of what organic production should be and, perhaps, could be if the sector continues to grow and develop but I doubt they have little detailed understanding of how we might get from where we are now with the current regulation to their ideal position. So what does the new regulation require? Below is a response to many of the most important changes that will effect the organic grain sector in the UK and some reasons as to why we should not adopt these proposals and should fight to have see they are not implemented. It is far from a comprehensive critique. will end the concept of “parallel production”. This is the ability for farms to run both organic and conventional land at the same time. Most of the larger organic cereal producers in the UK will have used a phased conversion to complete the conversion of their land without leading to significant problems of contamination of organic products. Whilst some producers wish to maintain their conventional businesses alongside their organic ones for perfectly sound reasons such as landlord preference or simple risk management. This does not mean these producers are in any way seeking to act outside the regulation and I believe we have the certification process in place to ensure such producers maintain high quality organic production systems. reduces the quantity of inconversion grain which may be fed to 15%. This will reduce the demand for inconversion cereals and make the costs of organic conversion greater. Both this and the measure above will reduce enthusiasm for additional conversion to organic production. will end all “exceptional acts” or derogations as we know them. This would effectively end the ability for organic growers to use non-organic untreated seed. Without robust seed production systems this makes organic arable systems less robust when faced with a poor quality harvest. Such an idea may have merit if it led to the development of varieties truly suited to organic productions systems but the size of the sector means this is very unlikely as the investment in the breeding would not be recovered. require that all feed (60% for monogastrics) come from the holding of livestock production or within the region. The “region” remains undefined but seems hugely problematic unless the definition means the “region” is so large to the point it is simply meaningless. Whilst a greater focus on UK production is welcome this measure would send such massive shock-waves through the industry it seems likely that operators in the livestock sector would decertify and the sector shrink significantly. Perhaps then rather than importing grain form less well regulated Black Sea sources we would simply import livestock products. Is this really the intended consequence the EU seeks? require decertification of produce that tests positive even if the contamination is not the fault of the producer. This is the inversion of “innocent until proven guilty”. A positive test could lead to product decertification regardless of the cause of the problem. The response to this would be the introduction of greater testing through the supply chain at huge cost. In the arable sector the UK producer base has tiny instances of contamination coming from farm. The more problematic supply chains whether fraudulent or adventitious are those abroad and particularly outside the EU. Other organisations will have varied and compelling arguments as to the effect on the proposals in their sectors. The policy-heads at Organic Research Centre and the certifiers have concerns about the way in which the new proposals will be implemented and the structure of the decision making process with the EU bureaucracy. These are also valid criticisms if they make the process less open and difficult to influence by operators and stakeholders. The consumer responses to the consultation have given the EU a position of championing the consumer and their wishes but the task of political leadership is surely to balance these wishes with the multiple concerns and needs of the operators within the sector. These proposals have an unbalanced basis and have not been well considered as the seems to be little thought or regard been paid to the consequences that may result. Please take every opportunity you have to oppose the changes the EU is suggesting and support industry bodies in their opposition.